Can you believe? : Do you believe in America? Do you believe in America? Here is a transcript and edited video of what President Obama actually said. Are you a believing Christian in the United States? If so, are you honestly offended? Obama's remarks include a few platitudes and a lot of verbal glad-handing, some of which is just the normal courtesies you expect when a president has the microphone. But what is offensive? We expect opposition politicians to find every possible excuse for criticizing a president--that's normal, it goes with those jobs. But it's hard for me to understand this kind of extreme language--"he has offended every believing Christian ... Obama does not believe ... the values we all share"--delivered under color of Christian piety after a speech that has just pleaded for getting on our knees in prayer and, repeatedly, for humility. 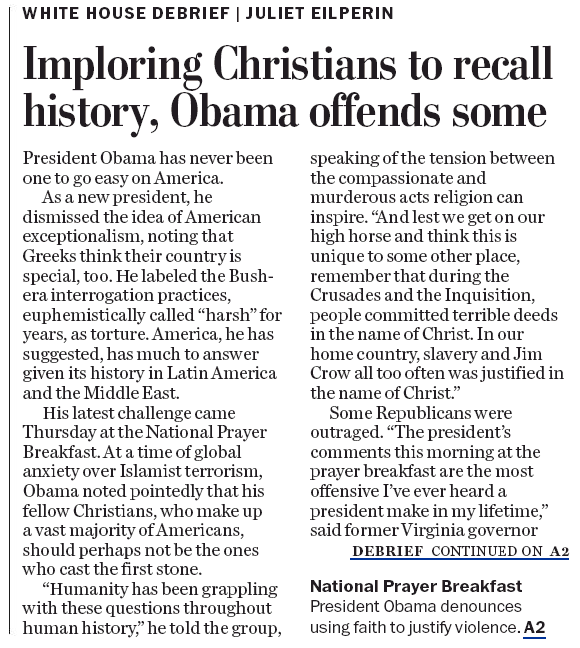 There is a clue in former governor Gilmore's comments: "Mr. Obama does not believe in America." In secular terms, it's hard to evaluate such a blatantly political comment, because maybe Gilmore thinks that the true test of patriotism is to agree with his own political convictions. Objectively, I would argue that Gilmore should either show us how Obama has not had his country's best interests at heart, or has chosen to sabotage the country he promised to defend, but we all know political bluster when we hear it, and this sounds like more of the same. But, theologically, neither Gilmore as a professed "believing Christian" nor Obama as another believing Christian ought to "believe in America." We believe in the Creator of the heavens and earth; we believe in the person and work of Christ and the immediate fellowship of the Holy Spirit, Who transcends all the princes of this world and their works. I am most definitely not offended when a believer in high office points out that the God who inspires our ethical ideals also impels us to acknowledge when our country or our religion falls short. Any politician who uses freedom of speech to bash another politician, claiming Christian license to put patriotism or piety ahead of Christian faith itself, should be rebutted. And in the specific indictment made by Obama, the very blood of the victims of the Crusades and the Inquisition (of whatever faith or none), of slavery, Jim Crow, and other church-endorsed sins against humanity, cries out for honesty. Charles McCarthy once said, ironically, "Being church means never having to say you're sorry." Similarly, some of our politicians seem to think that "Being the USA means never having to say you're sorry." Both sayings are incompatible with biblical faith; both are wrong. The martyrdom and upcoming beatification of Oscar Romero: how "Pope Francis Just Showed He's Not Afraid..." and why it's all a big deal. Bill Yoder: "Does Ukraine harbor 'small fascisms'?" Timothy C. Morgan on Kenji Goto and Japanese Christianity. BBC News video magazine on priests as astrophysicists. More on Christian modesty: "When Suits Become a Stumbling Block." Totally agree with your post, Johan. Hyper patriotism, I believe, is turning (has turned) into idolatry among Christians. I'm ashamed of the hatred I see directed against the President by Christians. The verses you chose above are spot on. Thank you, dear commenters! I see that Micah has posted his commentary. The governor's comments are but another example of the arrogance of those who believe in the "exceptionalism" of the USA. Thanks for your on-the-mark commentary.